We’d love your help. Let us know what’s wrong with this preview of The Dreadful Tale of Prosper Redding by Alexandra Bracken. I would say it's a pleasure to meet thee, Prosperity Oceanus Redding, but truly, I only anticipate the delights of destroying thy happiness. Prosper is the only unexceptional Redding in his old and storied family history — that is, until he discovers the demon living inside him. Turns out Prosper's great-great-great-great-great-something grandfather made — and then broke — I would say it's a pleasure to meet thee, Prosperity Oceanus Redding, but truly, I only anticipate the delights of destroying thy happiness. To ask other readers questions about The Dreadful Tale of Prosper Redding, please sign up. Is it in first person? 4 Stars! I really enjoyed this book. It was a fun, lighthearted and also SUPER SPOOPY Halloween/autumnal read! I’m not the most qualified middle grade reader as I’ve read more middle grade books this month than I have in the last two years, but I do think it is a bit more mature than other’s that I’ve read! I constantly forget that Prosper and Nell are only 12 – their voices feel at least 14/15 (and I don’t mean this to say it is inauthentic! I think it may have made the better fit for me as a re 4 Stars! I really enjoyed this book. It was a fun, lighthearted and also SUPER SPOOPY Halloween/autumnal read! I’m not the most qualified middle grade reader as I’ve read more middle grade books this month than I have in the last two years, but I do think it is a bit more mature than other’s that I’ve read! I constantly forget that Prosper and Nell are only 12 – their voices feel at least 14/15 (and I don’t mean this to say it is inauthentic! I think it may have made the better fit for me as a reader.) I think many older readers shy away from middle grade, thinking it is “juvenile” but I think this novel would appeal to non-middle grade readers. I really enjoyed our main character, Prosper, his cousin, Nell, and even the main antagonist, Alastor the demon that’s trapped inside Prosper! The dynamic of all three of these characters was super fun and unique and I am especially interested to see how things change in book two! I unfortunately think the weakest point of this book was the plot for most of the story. I’d say the middle 70% of the novel is fairly mundane – We essentially just follow Prosper as he adjusts to living with a demon inside of him at a new school under a false identity. We do have some chapters from Al’s perspective without Prosper, but I did find those boring compared to the rest of the story. There is not a lot of action scenes, nor many significant or memorable events until we are approaching the climax of the story. I feel there could have been a bit more content in the middle of the novel to make the plot stronger! That being said, the ending was fantastic in my opinion. It strikes that balance of “Well this was somewhat to be expected, but I’m still utterly shocked, blown away and anticipating what is going to happen next!” I really enjoyed the last few chapters of the novel, so many twists and turns and places to pick up on for book two! Although the plot wasn’t my favorite aspect, the ending did make up for some of it. 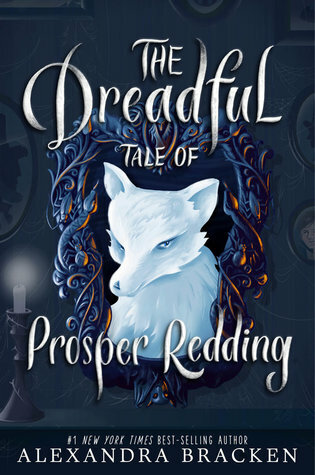 All in all, I really enjoyed The Dreadful Tale of Prosper Redding If you’re looking for a light-hearted, humorous and spooky read, I think it would be a good choice for you! I do wish the book was a little more developed, but I have faith that this can be improved in book two as Alexandra Bracken is an extremely talented author. I’m very satisfied with her first middle grade novel! This book was so unexpectedly beautiful. This is the best middle grade I’ve read since Harry Potter. Plus, this is beyond perfect for the Autumn and Halloween season. The prose is so lyrical, the characters are so heartwarming, and the messages are so important. I recommend The Dreadful Tale of Prosper Redding with my whole heart. This is a story about a young boy named Prosper who has grown up never feeling like he has ARC provided by the publisher via Netgalley in exchange for an honest review. This is a story about a young boy named Prosper who has grown up never feeling like he has fit in. His twin sister is the only person he feels understands him, while she is also battling a very scary heart condition. Prosper has always felt like the odd one out, especially since his family is very rich, very successful, and very powerful. But then it becomes very apparent why his ancestors were so lucky. ➽Human World - where we live. ➽The Fiend World - where evil humans who make deals serve for eternity. ➽The World of Ghosts/Specters - where evil humans’ spirits go when they die. ➽The Realm of Ancients - where the creatures that created magic live. There are many different types of fiends, but only malefactors are supposed to make deals with humans. And Prosper’s ancestors made a deal with a demon named Alastor, so that they could beat a rival family and become the powerful and reputable family they are today. And that demon is currently inside of Prosper. Prosper is then forced to flee to Salem, Massachusetts, where he is introduced to a whole other family and he gets to see what it’s like to start over and become the person he wants to be. I mean, while also struggling with a demon who is constantly trying to take over his body. Salem, demons, witches, hobgoblins, elves, ogres, magical familiars, old books and libraries, falling leaves, The Crucible, pumpkins, cafes… I mean, we are thrown into the perfect Halloween setting, with some of the most beautiful autumnal writing I’ve ever read. This is truly the perfect Halloween novel, and it’s perfect for all ages. And it was so very funny! I was constantly laughing out loud. I mean, it makes it rather hard to hate Alastor when he is making you laugh constantly. His inner monologues with Prosper are nothing short of genius, and Alastor discovering how much the human world has changed over many centuries was literary perfection. This is the first thing I’ve ever read from Alexandra Bracken, but now I want to buy her entire works. And the messages that Alexandra Bracken discussed in this were so important, too! Prosper, Alastor, and Nell (Prosper’s new found cousin), all are constantly learning that it is never too late to start over and become the person you want to be. Everyone is deserving of a fresh start and we shouldn’t have to be our parent’s mistakes. And hold grudges, that just keeps hate in your heart, isn’t worth anything. This book also carries a super amazing message about how important it is to have art programs in school. This story heavily talks about different arts, whether it be painting, drawing, or theater, and how young kids truly have a beautiful outlet in art and how it can shape who they are as people. There was also an important discussion on Nell, a young girl, wanting to play the role of John Proctor, the main male protagonist in The Crucible, and how there wasn’t any reason why she shouldn’t be able to audition for the role. Also, Nell’s mother was a lesbian witch in this story and if that alone doesn't sell you on this book I’m not sure what will. But in all seriousness, we need more middle grade books that normalize LGBT+ families. I loved this aspect of the story, and even though I wish it could have been a little different (view spoiler)[Nell’s mother is dead throughout the whole book (hide spoiler)], but I was still absolutely delighted at this minor plot point. Also, Nell is such an amazingly adorable little witch in general, and she has some pretty awesome creatures looking after her. I will warn you guys that this book has a very abrupt cliffhanger that will make you ready to make a deal with a demon for the next book. But this didn’t make me from loving this book any less. I loved this entire book with my whole heart. There is no doubt that this is going on my best of 2017 list at the end of the year. I normally don’t even like middle grade novels that much, and I will admit that this one leans towards older middle grade, but I was completely captivated and enthralled with this the whole entire time. This is an absolute must read for the fall season, and if you’re looking for an autumnal read then look no further than this perfection. This book was all about witchcraft and demons, blood-soaked contracts and centuries-old curses which is all contained in the spectrum of this month’s spooky theme and I loved it! Plus, the concept of being possessed by a demon who not only helps you with your mythology homework and takes over in P.E classes but also speaks exclusively Shakespearean and makes commendable (if doomed) efforts at speaking millennial yet comes off as an old jaded relative commenting on a Facebook status sounds pretty This book was all about witchcraft and demons, blood-soaked contracts and centuries-old curses which is all contained in the spectrum of this month’s spooky theme and I loved it! Well, I am at a loss how to rate this one. For one thing, I loved it (even though I'm a bit grown up for this sort of lit, hmmm... ). The language, the demon's quirks and the boy's character and the doomy-gloom of the story development, interspersed with crunching spiders. cheerfully... the magic and the Goetia-like plot background... all of this is woven into a very engaging text, a hilarious one at that. On the other hand, Goetia isn't the most wildly read by kids book. And even not by kids. A Well, I am at a loss how to rate this one. For one thing, I loved it (even though I'm a bit grown up for this sort of lit, hmmm... ). The language, the demon's quirks and the boy's character and the doomy-gloom of the story development, interspersed with crunching spiders. cheerfully... the magic and the Goetia-like plot background... all of this is woven into a very engaging text, a hilarious one at that. On the other hand, Goetia isn't the most wildly read by kids book. And even not by kids. Am I the only reader, stuffy enough to let kids read any thing they want but being slightly unhappy with them reading up on demonic possession, spawn of hell and the other nifty esoteric things? I'm impressed you know this many Greek letters... I suppose I should give you some points for creativity. (c) This is precisely how I feel when I get to read something horrible and am in a generous mood. We are, uh, entertaining a few options for solving your predicament at the moment. "...Magic has been around foe much longer than any of us could know, and flows from a space that exists between ours and whatever might lie beyond." If a man desired respect, he must not frame his every sentence a question. If you consider yourself to be an artist, then be that artist. (c) This pumpkin (and spider! )-munching malefactor occasionally sounds like some personal efficiency trainer, doesn't he? A quite good one, at that. I think it’s good that I chose this book to be my introduction to Alexandra Bracken. I’ve heard such spectacular things about her YA series THE DARKEST MINDS that I would have ended up being extremely disappointed with this book if I had read that one before. Possibly. There’s also the chance that I would have hated the YA series but that’s unlikely. Dystopian YA done well is my kryptonite. (That and cute gay romance.) Back to this book. THE DREADFUL TALE OF PROSPER REDDING is a fast-paced adven I think it’s good that I chose this book to be my introduction to Alexandra Bracken. I’ve heard such spectacular things about her YA series THE DARKEST MINDS that I would have ended up being extremely disappointed with this book if I had read that one before. Possibly. There’s also the chance that I would have hated the YA series but that’s unlikely. Dystopian YA done well is my kryptonite. (That and cute gay romance.) Back to this book. THE DREADFUL TALE OF PROSPER REDDING is a fast-paced adventurous tale. The characters are likeable and developed enough not to seem like cut-outs shrivelling in the rain. They’re entertaining. The main character himself always has something to say and do. He’s up for the challenge of being cursed by a fiend, however daunting that is to him. The fiend and he are a fun duo. Unfortunately, it tries too hard to be clever and humorous. The narrator and the fiend himself are so smug they’re borderline arrogant. Okay, the fiend definitely is. No sugar-coating here. Normally, if it’s part of the protagonist’s personality and adds something to the plot, I don’t mind it. I adore Magnus Bane, even if he reeks of assuredness. But if you’re trying to be funny, be sure you are indeed funny, otherwise it will look like you’re trying too hard… Alexandra Bracken. Perhaps younger readers will feel differently. I sure hope so. But that’s not to say I did not enjoy this book. I read it in two sittings, so if that says nothing, I don’t know what will. The villains are the kind you love to hate (my favourite kind!) and this author certainly has her surprises—beware of the plot twist. It shows that this is her first middle grade novel—hence the trying too hard part—but I’m sure she’ll improve, what with her professional writing. Prosper Redding has always felt out of place within his family. They are all so exceptional and he's, well....he's not. He feels like a disappointment to them, overlooked and misunderstood. One mysterious night, he discovers something extraordinary about himself. He has a demon living inside him! Apparently, Prosper's great- great- great- great- whoever, made a pact with this demon to ensure success for his family for generations to come. Somehow, he ended up tricking the demon to get out of the contract and now the demon, Prince Alastor, is set on revenge on the Reddings, with Prosper as his vessel. I know. It seems like a strange premise but this wacky Middle Grade novel is such a fun ride. Granted, there were moments, I didn't know what the hell was going on and honestly, I am still not sure that I am explaining it properly. The majority of the novel takes place in Salem, Massachusetts which is a town I know very well and love with my whole heart. The atmosphere of this is Halloween all the way. Thus, it would be the perfect read for October. Replete with all sorts of monsters, creatures, haunted houses, cemeteries and malevolent spirits going bump in the night. There is mystery to this as Prosper struggles to understand the truth behind his family's secrets and the demon living inside him. Speaking of the demon, let's talk about Alastor for a moment. I love him. His is fiendish and delightful and speaks in such a snarky, old-fashioned way. Ahhhh, what a treat. I laughed out loud on multiple occasions reading his banter back and forth with Prosper. I thought at times there was possibly too much description. That would be my one, albeit minor, issue with the book and perhaps why I think I may have missed some of the finer plot details. I was so caught up with the descriptive goodness of Halloween that plot points apparently went in one ear and out the other. But seriously, there was a cat-bat! A cat-bat, people. I WANT one!!! Alexandra Bracken has a new book? But really, who am I trying to kid? Anything Alexandra Bracken writes, I will read! This will be such a fitting fall read! And I know it's middle grade, but it should totally appeal to any age. The setting felt like the Halloween version of Stars Hollow! There are lots of potentially creepy elements, but the tone is lighthearted enough that it's just fun. I really liked how the elves and faeries were described. And I loved twelve-year-old Prosper as the narrator. His voice had a lot of personality to it (and so did the Malefactor demon thing possessing him). I was personally ki This will be such a fitting fall read! And I know it's middle grade, but it should totally appeal to any age. The setting felt like the Halloween version of Stars Hollow! There are lots of potentially creepy elements, but the tone is lighthearted enough that it's just fun. I really liked how the elves and faeries were described. And I loved twelve-year-old Prosper as the narrator. His voice had a lot of personality to it (and so did the Malefactor demon thing possessing him). I was personally kind of neutral on the story as a whole, but did love how certain elements kind of vaguely reminded me of the Bartimaeus trilogy or The Spiderwick Chronicles! I have been trying to get into Bracken's books for awhile now. The first book I read by her was Passenger. I didn't enjoy it, but she remained on my radar because I really like her writing style. Some people mentioned that this book remained them of Halloweentown. Naturally when I saw this in my library I requested a copy. Unfortunately I didn't like it. The writing style read condescendingly. Prosper was truly frustrating. None of the other characters were any better. Pretty much everyone in the Redding family was questionable save for their parents, Prosper, and his sister. His witch cousin was stuck-up as well. The demon was also boring and just odd. I felt that she didn't really write accurate middle graders (forgot their ages). Not everyone at that age is proud and rude. Yeah their kids and do stupid stuff but still. It felt forced rather than natural. Once again, this book was not bad at all but my choice of it was bad. Obviously, I was not the target audience but that did not stop me from enjoying this! I can't object on the writing as it is well written, and it even started out as a good, surprisingly dark and creepy book, but the middle part was expectable and boring for me that I even considered not finishing it, but I had to give Alexandra a chance and the last part of the book was good again. I am not sure if I will continue on with this series but Alexandra is a good author and I will give her other books a chance as I've heard many good things about them. To prove my point furthermore, I recommend this strongly to the target readers (Middle grade) as a Good Halloween read! I need book 2! Fell totally in love with these characters and the atmosphere. The audiobook is great btw. Major HalloweenTown vibes from this. It's also not often that I like the first act of a book the most but it happened here. I think it's because it was surprisingly dark for a middle grad book. Alex Bracken always delivers! This book was AMAZING! Dark and mysterious and that plot twist!!! I didn't even see it coming! I thoroughly enjoyed reading this and being in this new world! I can't wait to see what happens next!! Out of fairness, I won't assign a star rating to the book on Goodreads. This was a book that NETGALLEY recommended to me based on a pre-approval by Disney Hyperion. I think it's possible that sometimes we can outgrow a type of book and that might be what happened to me. I have noticed a few of my Goodreads buddies enjoyed it, but I feel the need to move on. Thanks to Netgalley for an e-ARC in exchange for an honest review. Very very good, need the sequel!!! Full review may come eventually. As Halloween just is around the corner, I decided to only read books that make me think about this day one way or another during this month of October. I’ve actually been preparing this project for quite some time now, at least a few months, watching youtube recommendation videos, reading articles about the subject and dissect Goodreads for book ideas. I wanted this list to mostly fit my TBR which need to grow smaller, but I’m open as I also want to go out of my comfort zone. I’m so ready for scary horror stories, and other tales with warlocks, werewolves, vampires and other folks. I’m ready for goosebumps and cold sweat. Possession, curses, demons, witches, a lost spell book, elves, ogres, fairies, hobgoblins, Salem… This book has 100% Halloween vibes and it was beyond perfect for my October project. This book is Middle Grade, which means it can be accessible to all age. I loved The Darkest Minds by the same author, liked its darkness and I was eager to read this book to see if I would find the parts I enjoyed while reading TDM. And it was even darker than I expected for a MG, and I was pleasantly surprised as MG is really not much my cup of tea. The first half of it didn’t catch me though, I had to really push myself to keep reading and avoid DNF it. But I’m glad I did, as the second half was more enjoyable. Prosper never felt like he fitted in his family. And for that matter, he never felt like he fitted in his town either. Redwood was founded by his family, and thus that should have made him someone to be looked up to, or at least respected, but it didn't. He is bullied by both his classmates and his grandmother with whom he is living. His only anchor is his twin sister, Prue, who almost died of a heart disease, but now that she is cure, she is the beautiful face of their parents’ charity organization to help those with heart condition. Every single member of his family is the representation of success except him. But Prosper soon learns that his family’s success is due to a deal his ancestors made with a demon named Alastor a while back, to beat a rival family. Except that when they wanted to cancel the deal and tried to kill him, Alastor decided to avenge himself by destroying the Redding family from the inside, and ended up being in Prosper’s body. This book really funny, I loved the humoral touch Alexandre put into it, it really made it enjoyable and something I could actually recommend to a MG. As a grown up I sometime felt like she was trying a tiny bit too hard to be funny but I concede that I smiled more than once. Actually Alastor ended up being my favourite characters in this book with his smart tong and how he was constantly discovering who humans (and consequently the way they speak) has changed since he first made the deal with Prosper great-great-great-great-grandfather. One of the things I admire the most about the book is Nell, Prosper’s newly found cousin. Her character represent everything I fight for daily: normalization of LGBT families to kids and the fact that we don’t need to make everything fit for one gender only (clothes, books, toys, and even toothpaste – I’m not kidding –). So, guys, if you're looking for something to read this Halloween i highly suggest you pick up this book! I love how it had some spooky vibes even if it's a middle grade, because it's not something that is usually found in the genre. But don't worry, it's not too creepy, the spookiness just gives it a little more atmosfere and for me it made a setting such as an old town in our world perfect for this kind of story. Anoth ARC provided by the publisher via Netgalley in exchange for an honest review. So, guys, if you're looking for something to read this Halloween i highly suggest you pick up this book! I love how it had some spooky vibes even if it's a middle grade, because it's not something that is usually found in the genre. But don't worry, it's not too creepy, the spookiness just gives it a little more atmosfere and for me it made a setting such as an old town in our world perfect for this kind of story. Another thing i really liked where the characters. Prosper, our protagonist, is a 12 years old boy from a prestigious and talented family but it appears he is the only one flowing against the current. He doesn't fit in at school and doesn't really have any friend apart from his twin sister that was very ill for half her life. But since she healed enought to have a normal life, is seems like she doesn't really have time for him. And on top of a family that doesn't really appreciate him, he finds out that he has a demon living inside him thanks to a curse. You see, the life every 12 years old wants. But living in Prosper mind was so fun! I loved his flow of thoughts and how sarcastic he was somethimes. And i really liked his arguing with Alastor, his demon. They were so fun together! Alstor always trying to cheat Prosper into a contract were some of my favourite scenes. And if i'm being onest i must say that all the scenes with Alartor were my favourite. He's just so much fun, talking in old english and trying to be evil! I would't mind that much to have him with me all the time, he looks like a grumpy old cat to me. All the characters also grow a lot in this novel, and that was really nice to see, because it gives them more depth. Over all, i can't really find anything bad to say about this book. The writing style was excellent and the story never boring. The settings were all super fascinating (omg, that horror house!) and the characters really fun! (this is v much an "it's not the book, it's me" situation tho so def still check it out if you're interested!!) dnf @ 9%. This was a pretty fun read! I liked the older vibes that came with this story and how Prosper’s old, powerful family has tons of secrets. I thought the clear commentary on what it means to belong were great, and I appreciated the characters’ growths toward having the courage to be themselves with confidence. I thought the magic was pretty interesting with some witches and evil demons with curses and hexes. I’m always interested in stories connected to Salem and that time period, so I was eating This was a pretty fun read! I liked the older vibes that came with this story and how Prosper’s old, powerful family has tons of secrets. I thought the clear commentary on what it means to belong were great, and I appreciated the characters’ growths toward having the courage to be themselves with confidence. I thought the magic was pretty interesting with some witches and evil demons with curses and hexes. I’m always interested in stories connected to Salem and that time period, so I was eating those parts up as well. Toad is so cute, so I really enjoyed when the batcat was involved. Prosper as a main character was very insecure, so you could really understand why he makes decisions and how he ends up in the situations that he does. You can easily feel for Prosper, and you hope he finds some wonderful, supportive people. The same could easily be said for Nell. I though her and Prosper’s blossoming friendship was great and super sweet. As for cons, I thought that the ending was pretty abrupt. Nothing is really solved or wrapped up. I think it’s important to have one thing resolved to give a since of catharsis and accomplishment when finishing a book, but this one doesn’t really have that. This book seems like she was taking the story one direction. Then she realized it may be predictable and randomly changed the main direction. I guess it’s good that you don’t see everything coming until a little before it happens, but there are a lot of loose ends that unless addressed in the next book, will make the story convoluted. Also the chapters from the malefactor’s point of view were jarringly silly when compared to the tone of the rest of the book. He’s very inept and ignorant even though he’s been hitching a ride with Prosper long enough to know what Halloween decorations are. He’s supposed to be this being of hundreds of years old, but he’s not very good at being evil. That’s another thing, he’s not very frightening. I never believed Prosper was in any danger from Alastor. But those chapters are meant to be very silly and provide some comic relief while Prosper’s life is a bit in shambles. Bellissimo inizio di una nuova trilogia/duologia firmata da Alexandra Bracken. E’ stato un libro super scorrevole e divertente, ho adorato il POV del protagonista, mi faceva tenerezza e volevo tifare per lui. Mi è piaciuta la costruzione del mondo e qualche plot twist vario nel corso della storia. Sono curiosa di leggere il seguito! Where have you gone, Bartimaeus of Uruk? Our nation turns its lonely eyes to you. Honor Redding made a contract of eternal success and survival of his family with a Malefactor, Alastor but a contract with a malefactor comes with a cost. Honor Redding wasn't as honourable as his name and eventually betrayed the malefactor. Alastor has eventually returned to take revenge. Since it's a middle-grade book, I will not judge it too harshly. To say the least, the story is rather confusing and I had to read certain parts twice to understand which is not a good sign for a middle-grade book. The writing style is quite spooky and creepy and I was completely intrigued by the time I reached the end of the book. It ended on a perfect cliffhanger and I cannot wait to read the second book in the series. That ending was just mean. I am so sad. I feel so betrayed. The Dreadful Tale of Prosper Redding features an absolutely delightful demon who simply stole the show. Prosperity Oceanus Redding is the first and only Redding to be completely ordinary, that is until he learns he has a demon inside of him. Four hundred years ago, one of Prosper's ancestors made a deal, and subsequently broke it, with a malefactor. Now that fiend has reawakened and is determined to destroy the family who betrayed him. With only two weeks to remove the demon and break the curse, The Dreadful Tale of Prosper Redding features an absolutely delightful demon who simply stole the show. Prosperity Oceanus Redding is the first and only Redding to be completely ordinary, that is until he learns he has a demon inside of him. Four hundred years ago, one of Prosper's ancestors made a deal, and subsequently broke it, with a malefactor. Now that fiend has reawakened and is determined to destroy the family who betrayed him. With only two weeks to remove the demon and break the curse, Prosper will have to rely on new allies while trying to keep from entering into a contract of his own. Alastor, the demon living inside of Prosper, was my favorite of the characters in this book. He's incredibly snarky and has no time for fools. He's conniving and works at every turn to try and trick Prosper into a contract. He's baffled by modern conveniences and abhors the current state of the English language believing it to be lacking in elegance. If the author were to write an entire book just about Alastor and his exploits, I wouldn't hesitate to read it. Prosper is where this book fell apart for me. I found him insufferable and couldn't stand his constant complaining. I understand that he's twelve years old and at that age most kids complain about everything, but he grated after a while. Cornelia, or Nell as she prefers to be called, was marginally better and I was interested to learn more about her and her magic, but the book never explored her character too deeply. Toad, the changeling who watches over Nell, was delightful and I wish there had been more scenes with him. This book is told both from Prosper and Alastor's points of view with Prosper's scenes in first person and Alastor's in third person. The changing perspectives threw me off a bit and while I get it was likely to help distinguish between the characters, I still had trouble whenever it shifted. I did like though how the author distinguished when Alastor was speaking in Prosper's point of view. Overall I think my lack of enjoyment of The Dreadful Tale of Prosper Redding is in part because I am not the target audience for this book. Also, I am a character driven reader and I had a hard time connecting with a twelve year old boy. I do think younger readers would enjoy this book and it's great for the Halloween season.